Combine cassava flour, arrowroot, baking powder, salt, and cinnamon in a medium bowl. Set aside. In another bowl, whisk together egg, milk, melted fat, and maple syrup. Once waffle iron is hot, add dry to wet and toss in apple pieces. Mix until thoroughly incorporated. Liberally brush melted butter/ghee on waffle maker. To make mini waffles, drop 1-2 tablespoon sized scoops of mixture in different areas of hot waffle griddle. I can fit 4 on my regular sized AllClad waffle maker. Each waffle maker will vary. Cook until golden brown. Serve hot. TO MAKE GLAZE: Combine coconut butter, coconut oil, and maple syrup in a small pot on low heat. Stir until creamy smooth and melted. Add melted mixture, drained cashews, vanilla, and salt to high speed blender. Add 3 tablespoons of HOT water and process until creamy smooth. If necessary, thin with an additional tablespoon of water to get desired glaze consistency. Spoon a bit of glaze onto mini apple fritter waffle and allow excess to drain back into bowl. Repeat until all waffles are glazed. Enjoy! If mini waffles aren’t your thing, you can totally make regular sized waffles with this recipe. You will get 3-4 regular waffles. 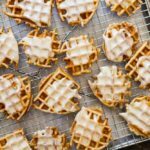 If the glaze is not your jam, you can make a simple cinnamon sugar to make these mini apple fritter waffles even more fabulous: 2 tablespoons of coconut sugar (or any dry sugar you have) plus 1 tsp cinnamon powder.